PP and PE prices in Asian and European markets generally follow a similar path when looking at the historical data, according to ChemOrbis. However, these major markets have been tracking opposite directions since early October, which causes confusion amongst players about the prospect of the market. In Europe, spot PP and PE prices reached the peak in the middle of September after a steady rising trend of 5 months. The settlement of the October propylene and ethylene contracts with a €40-50/ton decrease reinforced the downward trend in the downstream PP and PE markets in the early days of the month. Since then, spot PP and PE prices in Italy have been retreating in line with other European markets with players anticipating further decreases for the month to come albeit in small amounts. They are mostly pointing to retreating spot prices in the upstream ethylene and propylene markets. Plus, crude oil on NYMEX already broke below the $100/bbl threshold. In terms of market dynamics, although supply is not considered so comfortable across Europe, players deem it balanced with subdued demand. When looking at China, PP and PE markets were closed due to a week-long holiday in the first week of October, when the downward trend was confirmed in Europe. Both import and local markets remained firm in China after players resumed their work. The flooding in East China contributed to the firming sentiment in the country last week with concerns about tight supplies prevailing even though demand is still not great. “Prices have been moving higher because of supply limitations, but we believe that the market is getting close to the peak of the current trend and that further hikes are unlikely,” a producer source stated. 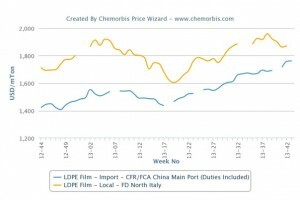 According to ChemOrbis, spot values in the upstream propylene and ethylene markets are also showing opposite trends. 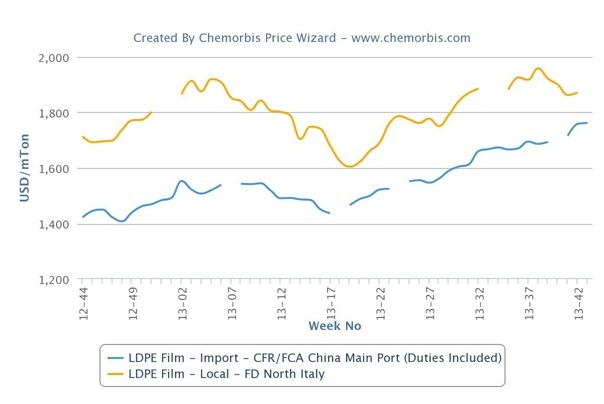 European monomer prices have been standing below the beginning of October while Asian spot monomer prices have been edging up since the early days of the month due to several production issues across the region.